A Canuck in Oz: Merry Christmas! background paper by Shabby Princess (Seasonal Sampler) - I'm sure the SP is lovely too but I do not know her. It was fun, a bit more difficult than I had anticipated, but once I got the right brush, the right temperature and the right frame of mind, it wasn't so bad. I finally ended up using the soap paint in a little oil burner, you know, the ones you use with tealight candles. That worked quite well, but sometimes I had to blow out the candle, and re-light it a bit later as it would make the soap a bit too hot. I don't suggest adding TiO2 as I found it made the paint milky and this was not the effect I was after, but for pastel colours it would probably be a welcome addition. I scented those with Champagne, simply because I love that Brambleberry Fragrance (which I get from AussieSoapSupplies.com.au here in Australia). I have also delved into the dark side and made a few digital scrapbooking pages! Mostly from kits from my friend HeatherT. She sells at two shops, all details are on her blog. I might post some of my creations, one day. In the meantime I'm still wrapping my head around the fact that there's only one year of primary school left for my two little ones, who are not so little anymore. One of them is 5cm shorter than me, the other, only three!!! I better start buying platform shoes! Until next time I wish you all a very Merry Christmas! I'm giggling at the platform shoes... Those soaps (really, can they be?) are just mind-boggling! I'm SO impressed! What fabulous teacher gifts. They look absolutely awesome. Thanks Myléne and Heather, my talented friends you! The soaps are made in a mould Heather. I'm not THAT talented. The paint is the hard part ;) it's fun!! What I like about stuff like that for teachers is that it's practical, calorie free (how many boxes of chocolate can one handle? ), and it doesn't take up space or gather dust over the years. Myléne! I love those little pegs you just made on your blog!! (well, I know you made them in your craftroom, but they are on your blog!!! Oooh, end-of-year tiredness hitting me all at once!). Wow! I can't get over how great these turned out. Bravo! You did a fantastic job with really amazing colors. 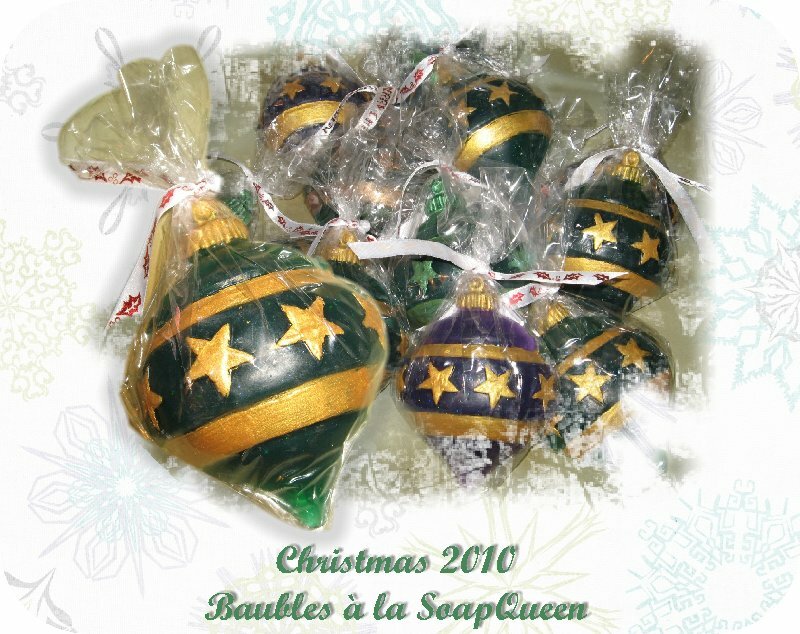 AMAZING soaps! You are super talented.